To Your Greek Orthodox Youth of America (GOYA) Volleyball Site! Our thanks to the Port Jefferson community for a wonderful VB Awards Dinner. The food was excellent. YOUR LEAGUE MVP's are Gus Coutis - PJ Boys ........ Kathy Kokkosis - Greenlawn Girls. To find out who won the other eight League Awards, feel free to ask someone who was in attendance. If you would like us to publish the individual team awards, please ask your coaches to email their names to us and we will dedicate a page to them on this site. As we conclude our 10th Goya Volleyball season, we would like to thank the following for their contribution, hard work and dedication to our youth: The 22 coaches that make up the NYC, Nassau, & Suffolk Divisions; The over 30 GOYA Advisors; The eleven Greek Orthodox Communities that have participated; The many public High Schools that have allowed the use of their gyms; and of course our parents who drive us to & from our games. May you all be Blessed by HIS grace and continue in this FELLOWSHIP! Girls League - Hicksville (Holy Trinity) vs Greenlawn (St Paraskevi) in Championship Game - GREENLAWN (ST PARASKEVI) WINS LEAGUE CHAMPIONSHIP! Boys League - Hicksville (Holy Trinity) vs Port Jefferson (Assumption) in Championship Game - PORT JEFFERSON (ASSUMPTION) WINS LEAGUE CHAMPIONSHIP! We have created this site to improve communication among our teams and to keep our fans, athletes, & parents up-to-date with the latest action and season events. By including such things as the dates, photos, highlights, and directions to game sites, We hope the site will cut down on phone calls and improve game attendance. The links presented in this site will help to improve your volleyball game as well as provide you with information on the world of volleyball. Make sure to check out the "Coach's Corner" page for Game NEWS & UPDATES as well as your coaches comments on various games. Your coaches will also offer helpful tips and instructions. We welcome your input and of course feel free to forward any game photos that you would like to see published on this site. The 2006 ALL-STAR Game was Saturday May 6th. This year we had quite a talent pool of ALL-STARS. To see the ALL-STARS listed please go to the Play-Offs page of this website! Coaches & Players you can now send in your nominees for the League Awards. Your name must be on your teams 2006 roster to be eligible to nominate a fellow player. Please be sure to identify yourself and your team in your email to us! READ ALL ABOUT IT! Suffolk County Boys Varsity Volleyball - Sachem East & Smithtown East Ranked @ Top but Hauppauge -The Team To Watch! Division Champion Listings, Team Rankings, & Play-Off Format! News About The Play-Offs - Sat. April 29th! News About The All-Star Game - Sat May 6th! Astoria And Brooklyn Enjoy A Good Pizza! Take Me To Team Photos Please! Want to learn more about Volleyball! Drills, work outs, coaching, etc. CLICK HERE! 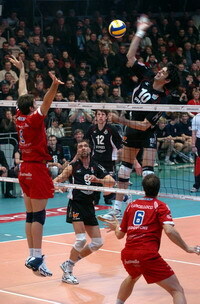 Do you need Volleyball equipment: Balls, net, poles, ref stand, uniforms, etc. CLICK HERE! Not sure about the rules or just want to get familiar with them! CLICK HERE! Volleyball News From Greece! CLICK HERE! Team USA vs Team Greece - What An Amazing Match! More News From Greece Of Olympiacos PIRAEUS CLICK HERE! More News: "Long Island Goyans Practice Philanthropy" CLICK HERE! One of our GOYA Alumni is in the center of this Triple Block Defense! Talk about reach on both the Blocking Defense and the Attacking Offense! Our GOYA Alumni put up the perfect set. NOW ATTACK! How well do you know your volleyball league? 1. What girls team won the very 1st League Championship? 2. Who was last years League MVP for boys? 3. What year did your Volleyball League begin? Congratulations to Dimitrios Kolokotronis (Flushing) for answering all the questions correctly! Please take me back to the GOYA Volleyball Game Scheduling/Standing website! GOYA Volleyball League - "10 Years of Growth, Achievement, Understanding, & Fellowship"